Finding mention of your ancestors as you search for family history is always a thrill. But it's hard to beat the excitement of finding actual photographs of long-gone relatives. In Part I of this post, I covered searching old film and video (moving images). Now it's time to look at resources for still photography. Corbis is one of the largest commercial sources of modern and historical photos, and includes the fabulous Bettmann Archives among other collections. There is an enormous amount of historical material here, mostly of the rich and famous, but with a surprising amount of the everyday mixed in. You can search Corbis at no cost, and see watermarked versions of the photos available. Use the More Search Options to limit results to particular dates, locations or collections (such as Archival photos). Genealogy Images of History is an odd collection, chiefly from the US, but there's actually quite a bit here, making it well worth a search. You can see a watermarked version of images, mostly from old newspapers, and can, of course, purchase the full image. The NY Public Library's digital images collection contains more than 700,000 images, including close to a hundred Bournes. And don't forget a search at Google Images and Flickr. 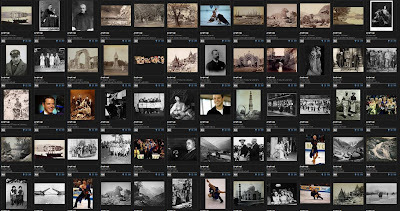 These are vast repositories of images, and are easy to search. Each has many thousands of Bournes, mostly contemporary, but you never know what might turn up!